Before there was Zen Box Izakaya, there was a much smaller lunch place in the Minneapolis skyway called simply Zen Box. They sold Japanese-style lunch to go—bento— which is the Japanese name for a lunchbox—not the Japanese translation for the thing we Westerners know of as a lunchbox, but the name of something uniquely Japanese that is roughly like a lunchbox. Of course, since we’re all Japanophiles now, you probably know all that. 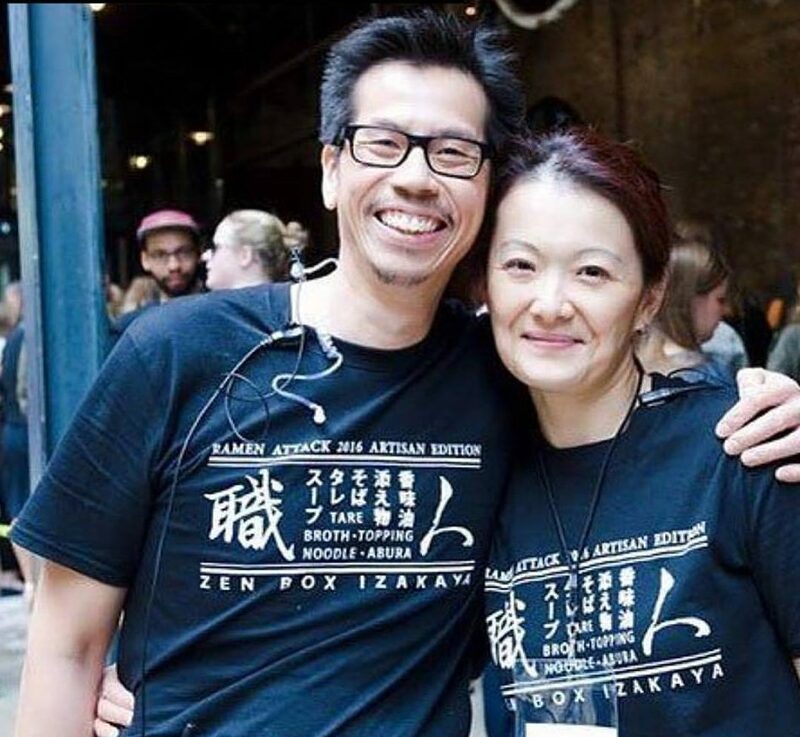 The owners of the original Zen Box, as well as of Zen Box Izakaya, were building toward opening an izakaya all along, and so they kept the name, and continued to serve bentos on the new menu. Eventually, they closed the skyway place and just put all their attention and energy into the izakaya. We did lunch at ZBI, Kat and I. Although I did not ask Kat to be my “designated pork eater,” they were happy to oblige—which is really great because of the ramen. The chef of ZBI is classically trained in and passionate about the production of ramen with a traditional pork bone (tonkotsu) broth, and it is the one dish that a person should try, to get the essence of the place and this chef and his work. ZBI is the only (as far as we know) actual izakaya in Minneapolis. It is also one of the top places—some would say the top place—to get ramen as it is meant to be. So what is an izakaya, and what is ramen meant to be? Zen Box Izakaya’s mission in life can be summed up in two phrases—Japanese comfort food, and craft ramen. But put another way, ZBI’s mission in life is to introduce a new and more accurate version of the breadth of Japanese food to Westerners who think that Japanese food begins with sushi and ends with matcha tea and doesn’t have that much to offer in between. “Izakaya,” in the words of Wikipedia, “is a compound word consisting of i (to stay) and sakaya (sake shop), indicating that izakaya originated from sake shops that allowed customers to sit on the premises to drink.” Izakayas are as ubiquitous in Japan as pubs are in Britain and Ireland, but institutionally, they are perhaps more analogous to tapas bars. Even though they started out, in the 18th century, as simply places where patrons (all male back then, and for quite a while after) could stop and drink sake rather than taking it home, within a few decades they started adding small plates of food, almost exactly like tapas. Nowadays they are more about the food and the atmosphere than just the sake, besides the fact that there are lots of other drinks now, such as beer, whiskey, and even matcha lemonade. And, like tapas, the food in an izakaya is simple and inexpensive—comfort food for working people—but is nonetheless very high quality, not junk food as is often served in Western drinking establishments. Take ramen, for example. Americans may think of ramen as a cheap and convenient student food, with a mysterious powder that turns into broth. But that’s no more what ramen is meant to be than any other great cuisine reduced to a canned, frozen or reconstituted convenience food. Ramen is a serious food in Japan, despite the fact that it originated in China. (“Authentic” Japanese food includes a lot of foods borrowed and then made uniquely Japanese from other Asian and also some European cuisines.) In fact ramen, and most especially its broth, is a fine craft that takes expert teaching and years to learn. Now it’s time to meet the chef, John Ng, and his spouse and co-owner, Lina Goh. We learned in an interview with Dale Yasunaga of Heavy Table that, “Ramen is one of the most consumed dishes in Japan, even more so than sushi. It is a very personal dish to John which he learned from his sensei (teacher) Koji Okada, one of the first ramen chefs that introduced the craft to San Francisco in the late 1980s. John learned the art of ramen and the traditional cooking process and techniques, with emphasis on the broth (body), tare (base flavor), and aroma (infused oils) to make the perfect broth.” ZBI’s broth is based on tonkotsu, not to be confused with tonkatsu, which is also on the menu. Tonkatsu is a breaded pork cutlet, roughly similar to schnitzel. Tonkotsu means pork bones, although the broth may also use chicken bones, miso and/or mushrooms to build the complex umami flavors. ZBI’s basic ramen blend also contains chashu (pork braised in sake) and soft-boiled egg, and is garnished with menma (fermented bamboo shoots). It also comes in a kimchi version, as mentioned before, or a miso version, garnished with bean sprouts and corn. In addition, weekly special ramens give the chef a chance to explore and hone his craft, and regular guests who love ramen a chance to be adventurous. Despite Zen Box Izakaya’s specialty ramen, I had my heart set on a Tuna Poke Bento, mainly because this series is about lunch, and bentos are only served at lunch. I was eager to try all the little side dishes that come with Bentos and especially interested in the raw, marinated tuna of the Tuna Poke Bento. This lunch included a cup of miso soup, edamame, cabbage salad, age gyoza (fried dumplings, a Japanese version of the Chinese potstickers), and a choice of white or brown rice, plus the tuna in poke sauce, which sits on a bed of raw, fresh greens. This was all very delicious, but I couldn’t quite finish it, possibly because I also succumbed to the temptation of a “Zero Proof Cocktail,” of which there are five on the drinks menu. I have to go off on a rhapsodic tangent about this drinks menu (this sort of stuff is why we go out to eat, even if we are a very good cook ourselves, thanks very much). This three-page affair starts off slowly, with a list of the non-alcoholic options including the aforementioned; a pretty decent list of brand-name spirits including 16 Japanese whiskeys; and a short but interesting selection of beer and wine. Then things get interesting on page two, which is, unsurprisingly, the sake list, which is an education in itself, followed by the shochu (Japanese rice, barley and other liquors) list and the chu-hai (cocktails made with shochu) list. The separate cocktail list that blows your mind is on page three. These are not your native country’s cocktails, with their wickedly inventive ingredients, indecipherably clever names, and little stories attached that try to help decipher the name. My mind would love to tackle this list, but alas, I know my liver will never be up to it. So I had the Zero Proof one called Good Juju, which contained yuzu, mint, demerara, blackstrap bitters, and soda. It was nice. I will definitely have to go back to Zen Box Izakaya. Maybe on the bus, so I— um—don’t have to pay for parking.